Gourmet eating for the avid calorie counter. 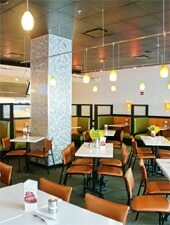 : A local French cook has taken it upon herself to turn away from butter and all sorts of rich, creamy dishes to showcase a line of calorie-trimmed fare in this cafeteria-as-restaurant. Indeed, you can start your day with a light but healthful breakfast of oatmeal, muesli, yogurt and an egg white omelet tartlet, all accompanied by a “soupdrink” of blended fruits and vegetables. Lunch and dinner options also fall within the minimal fat and calories category: meat-filled tartlets (the crust is low-fat and fillings include ground bison, ground turkey or chicken), big salads, vegetable-fruit drinks. A short list of French wines is available. For anyone looking for a low-cal substitute for fast-food chains, Litestars may be the answer.